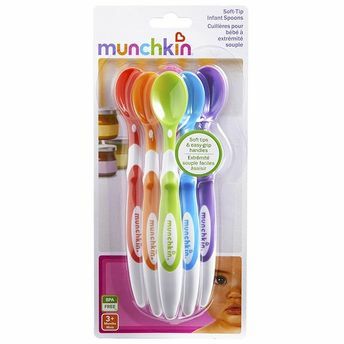 Munchkin's Soft Tip Infant Spoons are designed specifically to help you with baby's first feedings. The soft tips and rounded shapes are gentle on gums, and the shallow spoon bowl makes it easy for your little novice to eat. The spoons were made with mom in mind, too - the special handle is ergonomically designed for a comfortable hold and just the right length to reach the bottom of baby food jars. Ready, set, feed with ease!